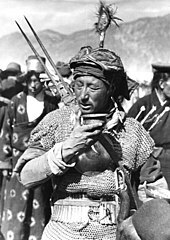 Tibetans speak Tibetic languages, many varieties of which are mutually unintelligible, which belongs to the Tibeto-Burman language group. 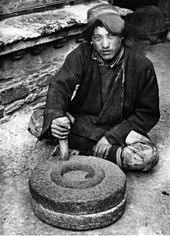 The traditional, or mythological, explanation of the Tibetan people's origin is that they are the descendants of the human Pha Trelgen Changchup Sempa and rock ogress Ma Drag Sinmo. It is thought that most of the Tibeto-Burman speakers in Southwest China, including Tibetans, are direct descendants from the ancient Qiang people. Most Tibetans practice Tibetan Buddhism, although some observe the indigenous Bon religion and there is a small Muslim minority. Tibetan Buddhism influences Tibetan art, drama and architecture, while the harsh geography of Tibet has produced an adaptive culture of Tibetan medicine and cuisine. This page is based on the Wikipedia article Tibetan people; it is used under the Creative Commons Attribution-ShareAlike 3.0 Unported License (CC-BY-SA). You may redistribute it, verbatim or modified, providing that you comply with the terms of the CC-BY-SA.